This is the third story in a series of articles on the Andaman Islands launched by Nature inFocus, in an attempt to showcase the natural history of these islands from the unadulterated perspective of its unique biodiversity. Each article from the series is titled with a line from J.R.R. Tolkien's Lord of the Rings poem - “All that is gold does not glitter." The monsoon reaches the Andaman islands a week before it hits the western coast of mainland India. We were deep into May, and the pond in our field station in Wandoor, South Andaman, was drying up. We were rationed a single bucket of water a day. We even placed bets on when the pond would fill up, but not convinced that it will ever rain. But, it did. As I sat working in the library one evening, the winds grew stronger, and I could feel its coolness. I could hear the rain approaching, from the sea, through the mangroves and the narrow forest patch, showering on the fallow fields across the road, rattling on the neighbour’s fleet of buses, shivering through the areca nut patch next door and finally banging loudly on our tin roof! And just like that, a whole other world was born. Thousands of winged termites awoke for their annual mating ritual. Light bulbs, computer screens and phone screens were all swarmed by armies of termites trying to mate before they shed their wings. They were in our rooms, in our clothes, in our eyes. In an hour, the frenzy had abated and dinner was served. Frogs, toads and half-foot long centipedes in dozens gathered to feast on the delicious meal of crunchy termites in their afterglow. These termites live for a few hours but are successful in leaving thousands of eggs in the promise of this cycle repeating the next year. Biology is as much about death as it is about life. Death is a great unifier in the biological world. Most organisms die or cease to exist at a discrete point in time. Organ systems fail and lose communication with each other and bodies become loose aggregations of carbon and nitrogen compounds. Most organisms also lead up to this with the process of ageing or senescence, in which organs lose functionality progressively. In other words, natural death does not sneak up on you. Senescence research has been an active pursuit in the last few decades and we now know a lot about processes that drive this at the level of the cell. At the cellular level, senescence is caused by the shortening of the tail ends of chromosomes (condensed DNA) – telomeres, with each cell division. If each cell division was like photocopying a printed paper, this process is the gradual fading of the ink with each successive copy. Since cell division is the mechanism by which all multicellular organisms grow, the shortening of telomeres must limit the growth of all life, resulting in senescence. However, several species of trees, like bristlecone pines and giant sequoias, and a few fungi have been discovered to live and grow for thousands of years. 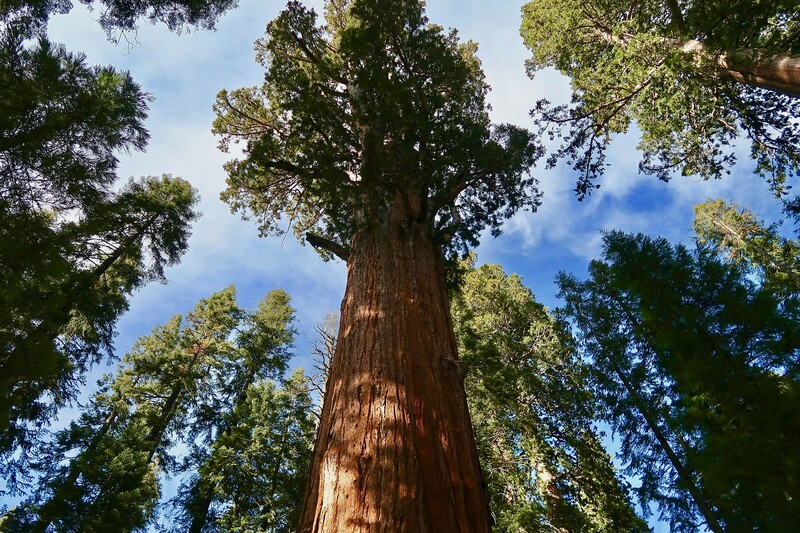 Researchers studying Giant Sequoias in the United States, a species of tree that can grow to be the tallest in the world, noticed that a larger tree grows more in a year than a younger, smaller tree. They liken this, in human terms, to a middle-aged man with an ever-increasing growth spurt. Ecologists have now found this to be true across most temperate and tropical tree species. They found that each year the largest trees put on the weight of an entire medium-sized tree! This is completely against the understanding that biological organisation is battling entropy or disorganised energy. Examples like these have made biologists consider that unlike in animals, plant senescence and whole plant death are different, independent processes. Why is this so? Giant Sequoia - Older sequoia trees grow more annually than their younger siblings. Photograph courtesy Pexels, under the Creative Commons CC0 license. Plants are fundamentally different from animals; plant cells have rigid cell walls that protect them from wear and tear. Besides, how they develop from a seed to a whole plant is different from how animals develop from the initial single-celled or zygote stage. In animals, the single-celled zygote divides into a few cells of the embryo that then differentiate into different tissue types, like nervous tissue or muscle tissue. Except for stem cells, every cell is now fated to be a particular type and lose telomeres with each copy. When the animal grows and needs more muscle tissue, new muscles are made from existing muscle cells. On the other hand, plant development occurs in modules, mediated by plant stem cells called meristematic cells. These tissues, found at the tip of the shoots, the tip of the roots and along the sides of the plant body, divide independently and make all the new tissue in plants. All new plant tissues, therefore, are copies of the original document rather than copies of copies. In evergreen forests, like those of the Andaman islands, light is a scarce resource. Because of sheer competition, most trees die young. But once they make it, 35 metres or so, to the top of the canopy, they are almost invincible. What then limits plant growth and leads to plant death? The obvious answers are disease, drought, herbivores, fires, hurricanes, and the timber industry. Even in an ideal environment though, the maximum height of a tree is limited by gravity. The larger a tree gets, the more are its demands on water and nutrients, which need to be transported from its roots to its leaves. For the tallest trees, this can be a distance of fifty metres or so and the energy required for this is enormous. Water flows from the roots to the leaves through a collection of thin long tubes called xylem. Air cavities in these columns interrupt the flow and render them permanently useless. Trees cannot survive beyond a small fraction of such damage. When drought hits a tropical forest, large trees are at a disproportionately larger risk of “cavitation” and death. So, ironically, the largest killer of giant trees are tiny air bubbles. Recent research has shown that some cloud forest trees whose leaves are always in humid conditions, enveloped in clouds, have evolved mechanisms to absorb moisture from the air, reducing energy costs and cavitation risk. This is probably why some of the largest trees are found in cloud forests! Near the western coast of Alexandra, an island in the Andamans, stands a Giant Padauk or Andaman Redwood tree. 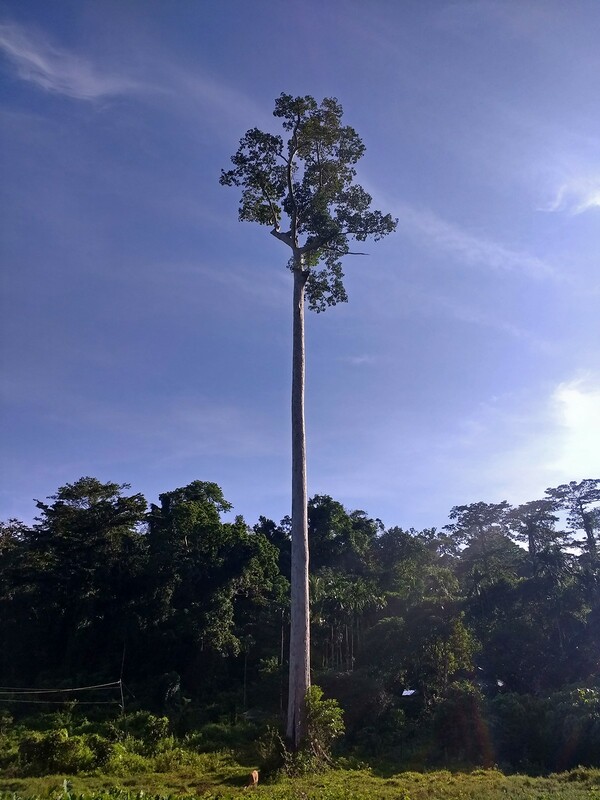 It stands with about a 45-degree angle to the ground, with a cavernous body and nurses several different seedlings, of trees and orchids on its giant branches. Working in our forest plots, this tree is a ready shelter for when it rains. Three, four, sometimes five of us have huddled under it, sheltered between its gigantic buttress roots and a termite mound that grows along one side. Against all odds, it lives on. 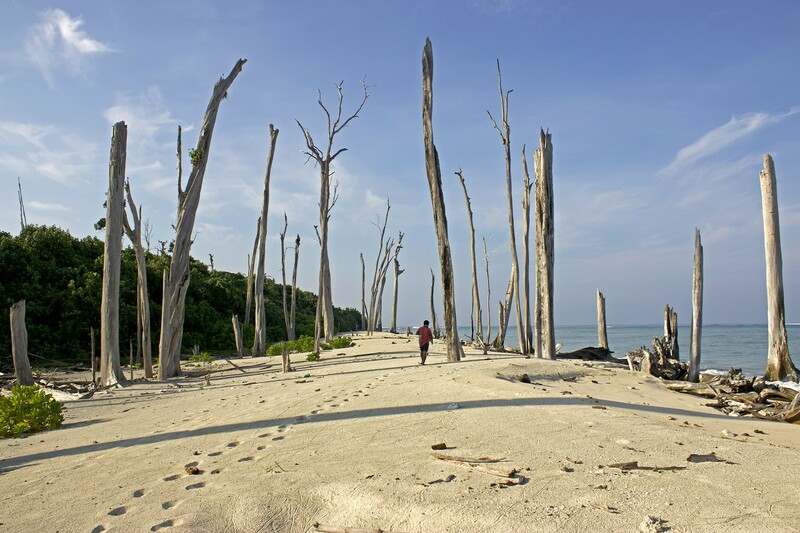 To read the next story in the Andaman series click here.